In. the last lecture I have shown how Zeno, just because he grasped the essential relation between the two opposed philosophies of the Cynics and Megarians, became the founder of a new philosophy. He was a man of much less speculative power than Plato or Aristotle; yet by this synthesis he rose to an idea which neither of them had attained, the idea of the unity of the consciousness of self—that consciousness which makes a man an individual in a sense in which no other animal is individual—with the universal principle which binds all things and beings together as parts of one world. We cannot, indeed, say that Zeno realised this idea in all its bearings; but it took possession of him, and gave inspiration and direction to his own philosophy and that of all his school. In this principle lay at once the strength and the weakness of Stoicism: its strength, in so far as it overcame the dualistic tendencies which had affected Greek thought from the time of Anaxagoras; and its weakness, in so far as it achieved this result rather by intuition than by explicit reason. Hence it was not able fully to master and reconcile the different elements which it brought together: what it did was simply to identify them and to ignore their antagonism. Stoicism was essentially what is called a Monism: and in so far as it was this, it had a kind of rationality which no dualistic system can ever possess. For any system that, directly or indirectly, denies the unity of the world, may be shown ultimately to lead to the denial that it is an intelligible world at all. How, indeed, can the universe be a icocr/mos, or intelligible system, if all the existences included in it be not essentially related to each other, if they be not constituent parts of one whole ? To understand anything is to see its distinction from other things; but distinction always implies relation, and relation presupposes a unity within which the related elements are contained. Hence if we try to isolate anything— to conceive it apart from all distinction and relation we make it unintelligible. To understand a thing is to give it a place in the one world of experience which exists for the one self; and to suppose that unity to be broken up and divided, is equivalent to the negation at once of the intelligence and its object. Hence it has been said with good reason that it is the beginning of true, philosophy to realise that all differences and oppositions of thought and reality are relative differences—differences within a unity, and that the very idea of an absolute difference is suicidal : for it is only as its terms are held together within a „ whole and so related to each other, that their difference has any meaning. This, indeed, was just the lesson to be learnt from the treatment of judgment by the Cynic and Megarian schools; for what they had really shown was that the judgment reduces itself to a tautology, if it does not express the relation of the universal to the particular. And this again implies that both the universal and the particular lose their meaning, if they are taken out of relation to each other. The truth of either can only be discovered, in so far as it is recognised that in their distinction they do not cease to be elements in one whole. In this way, again, we are led to recognise the systematic or organic unity of reality as the first principle or presupposition of all knowledge. VOL. II. y or of admitting a relative difference where he denied an absolute one. ■ Hence his monism means only that he identifies the extremes, or treats the distinction between them as simply a distinction of different points of view from which we look at the same thing—points of view which we may take up and dismiss according to the convenience of the moment. Thus Stoicism, on a superficial view of it, seems to be the most confused of all the philosophies : a philosophy which clings to the idea of the unity of all things, but which in its exposition of that unity passes abruptly from materialism to spiritualism, from individualism to pantheism^ from sensationalism to idealism, as the occasion may require, and without any consciousness of the difficulty of the transition so made. From this point of view, Stoicism might be regarded as a jumble of all the philosophies or, to use Kant's expression, as a " nest of contradictions," in which every way of conceiving things is represented, and none is earned out to its ultimate consequences. 1 See especially Bonhoffer, Epictet und die, Stoa. rational principle in the world, which is one in nature with the self-conscious intelligence within us, and that, through" all apparent disorder, this principle is inevitably realising itself. 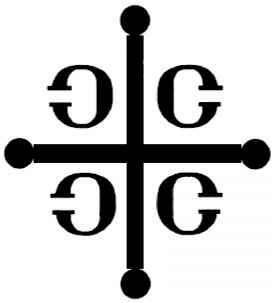 And this also explains how Stoic ideas became so easily blended with the nascent reflexion of the early church, and exercised #so powerful an influence on the development of Christian doctrine. The physical philosophy of the Stoics consists mainly in the development of the monistic view of existence, in opposition to the dualism that separated form $nd matter. It is often stated that the Stoics were materialists; but the truth which underlies this charge is, that they altogether rejected the dualism which had maintained itself in Greek philosophy from the time of Anaxagoras. The Stoics could not be content with any philosophy which divided heaven from earth, the spiritual from the material, which, in short, divided the ideal reality which we grasp in thought from the things which we touch and see. There is in them something of the same impulse which makes St. John insist upon the actual presence of the divine Lord in human form, in opposition to the Docetism which reduced his humanity to a semblance—"that which our eyes have seen and our hands have handled of the Word of life." Or, to ,take a more exact parallel, they rebelled against the idea of a transcendent God and a transcendent ideal world as modern thought has rebelled against the supernatural-ism of medieval religion and philosophy. The ideas of Plato and the forms of Aristotle seemed to them far off and unreal, and they declared against them in the same spirit in which Goethe repudiated the idea of a God who worked upon the universe from without (ein Gott der nur von aussen stiesse), and was not r immanently present in nature and in the soul of man. Just as Spinoza spoke of God and nature as two words for the same thing, and maintained the identity of the one divine substance which is presented to us under the two disparate attributes of thought and extension, so the Stoics refused to divorce, or even to distinguish, mind and matter, or to exalt the soul by opposing it to the body. Hence they asserted that nothing exists which is not corporeal or material, though they immediately qualified this statement by maintaining that there is nothing corporeal which is passive or inert, and that all activity implies a Logos or spiritual principle. The absolute antagonism of a purely active form and a purely passive matter, which is the crux of the Aristotelian philosophy, is thus set aside; and in its place we have the relative opposition of two elements, both of which are regarded as having ultimately the same nature and origin, and both of which are viewed as in one aspect material and in another spiritual. When, therefore, the Stoics are called materialists, we have to remember that they can be so regarded only from the point of view of a dualistic philosophy, which holds that in order to be spiritual, reality must be absolutely dissociated from that which is corporeal or material. On the same ground, we might as legitimately apply the term materialist to Spinoza or Goethe: for Spinoza maintained that extension and thought are only different attributes under which the same principle is revealed to us, and Goethe refused to think of God except as realising himself under the forms of sense, or of the material world except as the 4 living garment of Deity.' In fact, the Pantheism of *bhese later writers is closely akin to that of the Stoics, who assert, from one point of view, that the universe is a product or manifestation of divine reason, and, from another, that all things flow from and return to the fiery breath, the irvev^a Siairvpov, which is the quintessence of all matter. And this enables us to understand why, in seeking a metaphysical basis for their philosophy, the Stoics should go back not to Plato and Aristotle, but to Heraclitus, a philosopher who lived before the opposition of idealism and materialism had been formulated, and who therefore easily passed from one form of expression to the other without any consciousness of transition. Thus Heraclitus could speak of the secular process of the universe as the evolution of all things out of an ever-living fire and their return to it again, without being hindered from also regarding it as the manifestation of the supreme thought or reason, the yvdjuLrj or X0709 that ' steers all things through all things.' He could even say without any sense of violence that the fiery heaven which embraces all things is full of mind and reason (koyuco v koll (ppevrjpeg). At the same time, we must recognise the essential difference between the position of those who lived before the two elements had been distinguished, and the position of those who lived after this distinction had been so much insisted on by Plato and Aristotle. For those who, in this later time, refused to accept the dualistic theory there were only two logical alterna-* tives: either to explain away one of the two principles, or to show that their opposition is merely relative, an opposition within a unity. But the Stoics could not adopt either of these alternatives. They were too anxious to grasp the whole truth to be content with abstract materialism or abstract spiritualism ; yet, though they saw the weakness of such partial explanations, and had an intuitive perception of a unity beyond them, they could not bring them together as correlated factors of one complete system. Being thus unable either to admit that the opposition was absolute or to transcend it, they were driven to the alternative of simply denying it, except as an opposition of different aspects of the same thing, and falling back on the ideas of a philosopher who had lived before it was recognised. Matter and mind, therefore, appear in the Stoic as in the Spinozistic philosophy, as two parallel aspects or attributes of one substance. And though the Stoics are not so careful as Spinoza in marking off from each other the two lines of speculation which are thus opened up, according as we look at reality under the one or the other attribute, yet it is possible in their writings to trace out each line almost without relation to the other. On the material side then, the world, according to the Stoic view of it, may be thus described. In the first place, the idea of a purely passive matter is •rejected, and we have in its place a corporeal nature whose ultimate and most active form is a fiery breath irv&jfj.a 8id7rvpov, or, as Cicero translates it, anima inflammata, a kind of quintessence of matter, which unites the activity of fire with the diffusiveness of air. This fiery breath, again, evolves from itself the opposition of two relatively active and two relatively passive principles—fire and air on the one side, earth and water on the other—which stand to each other as do form and matter in the Aristotelian system, though the Stoics conceive the opposition as a relative and not an absolute one. Out of these elements all the particular existences in the world are produced. In every existence there is a fiery principle of unity, which holds it together and keeps it in tension against the other existences that might invade or destroy it. But this tension, this power of self-assertion and self-maintenance in all finite things, is limited, and only capable of holding out for a certain time. The Stoic, therefore, maintains that there is a kind of circular process of existence, in which all things that emerge from the central fire ultimately return to it again. The movement of expansion and differentiation is followed by a movement of contraction or integration, in which all things are drawn back into the f fiery breath' or spirit from which they were originally derived. The central fire at last reclaims all that it has given out, even that purest portion of itself which constitutes the soul of man. Again, all this material process has to be translated into idealistic or spiritualistic terms; for the fiery breath is also conceived by the Stoics as a 'germina-tive reason5 which produces and penetrates the whole world by its thought. And from it are derived the 'germinative reasons' which are the principles of unity in all the different forms of finite existence. Thus in inorganic things the germmative reason takes the form of a dominating quality (c^t? ); in plants it appears as a 'nature' or principle of organisation; in animals as a ' soul/ or principle of sensation and appetite; and in man it rises to its highest form as a ' rational soul/ which is a pure reflex of the divine reason. While, therefore, we are able to say that all things are derived from the germinative reason of the world, we can say this in a special sense of the soul of man, which immediately partakes of the nature of God, and may even be described as a part of Him, directly communicated to one privileged creature (divinae partícula aurae). And this is shown by the fact that it not only is a principle of unity in human life, but is directly conscious of itself as such. Thus, just as God is the ruling principle in the universe, sustaining, penetrating, and subduing all things to himself, so the inner self or ruling principle in man binds his whole existence into one, and subordinates all his other powers to itself. Yet we must not, in either case, make too much of the opposition between that which rules and that which is ruled; for the Stoic always remembers that this distinction is relative. God is not to be regarded as really separate from the world; and the particular existences on which he is said to act are all modifications, or, we might even say, parts of himself. And in like manner, in man also, the senses and desires, over which the ruling power or inner self has command, are, after all, only emanations of the ruling power itself, and not really external to it. As God realises himself and only himself in the world, so it is the ego and the ego alone that realises itself in all the powers of sensation and desire. And we may add that, just as, in the secular process of the universe, all existences spring from God, and are again resolved into His pure essence; so with man, life is a process of expansion, which is followed by a process of contraction, ending in the disappearance of all the other powers of the soul in the ruling part, and the separation of the soul from the body. And even this is only a preparation for the final consummation, in which the soul returns to the divine unity from which it came. Now we need not farther dwell on the physical or materialistic side of this process, the evolution of the world out of the central fire and its resolution into it again. The general theory is borrowed from Heraclitus, and the Stoics added to it nothing of importance; or rather, we should say, that they sacrificed whatever meaning it had as a physical theory in the effort to carry out the parallelism of matter and mind. Thus, while they maintained that all things are corporeal, they found themselves obliged to assert that matter is essentially active, and even to admit the possibility of a complete inter-penetration of material bodies by each other, and of all matter by the etherial fire. In other words, in order to be the counterpart of mind, matter had to give up its essential nature as extended and solid, as consisting of partes extra, partes which repel each other. Hence the physical theories of the Stoics may be at once set aside as having no scientific value; as, indeed, for them the material world had no real interest except as a part of man's life. Or perhaps we should rather say, that their interest was confined to the general doctrine that matter and mind are distinguished only as different aspects of the same thing, and that, this being granted, they cared nothing about the nature of special physical processes. And as time went on, they gradually ceased to concern themselves with physical subjects, except as supplying certain postulates which were necessary for their ethics. Thus the only important part of their physical philosophy came to be that which should rather be called metaphysics or. theology, the part which has to do, not with the relations of physical phenomena to each other, but only with the relations of the material universe to God, who is at once the central fire and the spiritual principle to which all things are referred. When we have got thus far, it becomes easy to see that the kernel or central meaning of the Stoic system lies in the combination of two ideas, which appear at once to be essentially opposed, and yet necessarily related to each other. The first is the idea of the self-centred individuality of the particular things and beings that make up the universe, and above all of man as a self-conscious being. The second is the idea of the unity of the universe as a whole, as the realisation of the one divine principle which makes the individuality of all particular things and beings, and even the individuality of man. himself, into its expressions and instruments. In the antithesis and the synthesis of these two ideas lies the whole interest of Stoicism. As to the first of these ideas, I have already said that the world is to the Stoic an aggregate of individual things and beings, each of which is an efflux from the principle of the whole, and in a sense a whole in itself; in other words, each of them has in it a principle of unity with itself, which renders it an individual, separate from and opposed to all other individuals. And with this individuality goes in each case the natural impulse of self-preservation—what Spinoza calls the conatus" in suo esse perseverandi, the effort to maintain and augment its own being. This individuality appears in more intensive forms as we rise in the scale of being, but only in man does it reach self-consciousness. And this, indeed, makes so marked a distinction between men and other animals that we might fairly say that he alone has a self in him. The ruling power of reason so dominates over his nature that he cannot be described as anything but a self-conscious ego; and, just because of this, all his impulses become concentrated in one great effort after self-realisation, in which he shows a high-strung energy wherewith nothing else in nature can be brought into comparison. In him the conatus in suo esse perseverandi swells into an absolute demand for happiness, for a perfect completion and manifestation of his rational being, in which nothing shall be left to be wished or hoped for. Only—and here the Stoic decisively parts company with the Cynic—the self-seeking impulse, as it becomes self-conscious, must recognise its own universal character. The impulse of a rational being, as such, is not to seek the gratification of its particular impulses ; it is to seek to satisfy the- self. Nor is it even to seek to satisfy the self, as one particular being, in opposition to other particular beings. To thjnk so would be to forget the universal nature of the self, which lifts man above his own individuality, and enables him to identify himself with the whole and with its divine principle. The Stoic, therefore, in seeking his true self or its good, must detach himself from his immediate life and all its special interests. He must look upon the fate of his own particular being with the same calmness and freedom from disturbance, with which he contemplates the fates of other beings altogether unconnected with himself. Eor what he must desire is to realise himself as reason, and reason is equally related to all objects, but not bound up with any one of them except in so far as it is a manifestation of rational principles. to make themselves the organs and instruments of the principle of that whole. Now, to this view it is naturally objected that reason in man does not show itself to be such a universal and impartial power of judgment as the Stoic describes. Rather we seem to find the views and aims of men always subjected to distortion and limitation by their national and individual character and circumstances. In their thought they are influenced by illusions and prejudices due to racial or individual bias, or to the peculiar experiences of their lives; not even in their highest intellectual efforts do we find them rising to a quite impartial and objective view of things. And in their practical conduct also they are continually misled by interests and desires, which prevent them from devoting themselves to any object independent of their individuality, and still more from acting with a single eye to the highest and most universal good. All this is obvious enough, but it is not inconsistent with the general truth of the Stoic doctrine—the doctrine that it is the essential characteristic of a rational being to look beyond himself, and both in theory and in practice to rise above his own individuality. For it is clear that if any man were utterly incapable of taking up a general jpoint of view, or oi looking at himself as an object just as he looks at other persons and things; if he were absolutely imprisoned in his own sensations, and were not able to make any allowance for their individual character or to regard them as he regards the sensations of others: if, in short, the world were centred for him in his own particular self, he would be literally insane. Similarly, if in action, he were quite unable to regard anything but his own impulses, and could not direct his will to any objective ends whatsoever or submit it to any general laws or social obligations, he would be a moral idiot; and we should be obliged to treat him as an irresponsible animal. 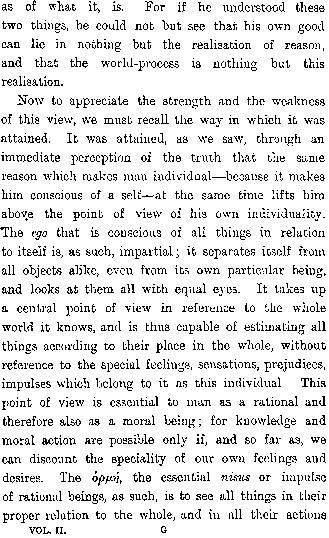 Henpe, in spite of all that is irrational and immoral in man's life, we must regard the reason that makes him man as essentially universal, that is, ,as a consciousness of self in relation to other beings and things as parts of one whole—a consciousness which, even while it constitutes his individuality, takes him beyond it. For to be a self, in spite of the apparent paradox, is to go beyond the self; and a human being cannot find a centre in himself, except so far as he recognises himself as part of a wider whole in which he is centred. At the same time—and this is what the Stoics in their abstract way of looking a<t things altogether fail to observe—the existence of this potential universality of reason in every rational being is one thing, and the conscious realisation of it in all the extent of its meaning is another. If we appeal to experience what we find is, that every individual has some elementary consciousness of a world in which all the objects he knows are brought into relation with each other, and some elementary consciousness of a society in which he regards himself as a member. But it is only through a long process of evolution that, out of such beginnings, there could arise the idea of the world as an ordered system, and the idea of a universal law which binds all rational creatures into one society. And when in the Stoic philosophy these ideas did arise, they at first took an abstract and therefore an imperfect form— a form in which the general conviction of the rationality of the system of things failed to lead to any consciousness of the excellence of the special parts of it, and in which the universal good of man, as determined by reason, appeared to be the negation of every particular end. The Stoic gets so far as to see that there is a unity beyond the differences of the particulars; but he is not able to use the conception of this unity as a principle by means of which each particular may be put in its right place in the whole. And a very long process of evolution was needed ere men could conceive the idea of a rational and organic order of the universe or of human life, in which each particular element, though rejected as an end in itself, might be reinstated as a necessary element of the whole, and all mankind, with justice done to their special characteristics, might be united in one TroXtrela rod Koarfxov. The idea of such a process of development, by which man gradually comes to the realisation of himself and of all that is involved in his rational nature, is entirely hidden from the Stoics. Recognising no distinction between what is actual and what is potential in man, they, as it were, stereotype the moral consciousness in the form that was given to it by their own philosophy; and they fail to see that that form is itself a stage in a long, process reaching back to the beginning of human history and containing in it the germs of the still higher ethical spirit of the future. Hence they state the rationality of man's nature in a way that seems paradoxical and inconsistent with facts; and they are unable to find a logical place in their theory for anything but absolute knowledge or absolute ignorance, absolute virtue or absolute vice. The value and importance of their moral idealism as an expression of one aspect of the truth, is easily seen,. but, in putting it forward as the whole truth, they deprive it of all verisimilitude. We cannot do justice to the nature of man without recognising that he is essentially rational, rational even in his utmost aberrations and follies; but it becomes utterly impossible to maintain this truth in the face of the most ordinary experience of life, unless we also recognise that he is a being who always is more than he knows himself to be, and whose consciousness of himself is not a fixed and definite conception, but an idea that lives and ^rows and is never completely at one with itself. When, therefore, we attempt to say what he is, we have to remember that we are expressing not what has already realised itself in him, but what is ever in process of being realised, and what cannot be realised except through a long conflict with nature and with himself. The abstract, unreal, and almost Utopian character of Stoicism lies in this, that it ignores the characteristics of man as a developing being, and treats his good" and his evil as fixed entities between which he Btands to make an arbitrary choice. And it remains an insoluble problem how, on such a view, there should be any possibility of his making a wrong choice at all. In order, however, that we may appreciate thoroughly the moral attitude of the Stoics, it is necessary that we should look a little more closely into their psychology.